As one of this years scholarship recipients I was asked to complete ten hours of community service in Florence. This was a great opportunity for me to engage with locals and give back to the city that his given so much to me! Where I decided to dedicate my time volunteering came about in an interesting way. For one of my classes, Florentine Art Walks, we visited a church named Santi Apostoli, which is a quaint, beautiful, and historically significant church to Florence. Built in the 11th century, it is thought to be one of the oldest churches in all of Florence and contains many significant artistic and architectural contributions. When we visited I thought It would be my only time seeing it amongst the many churches in Florence, but it turned out that I would be spending much more time there than I expected. 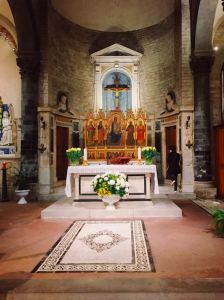 Over Easter my family came to visit Florence, and asked that I find a church for us to attend for Easter so that they could experience an authentic Italian church service. 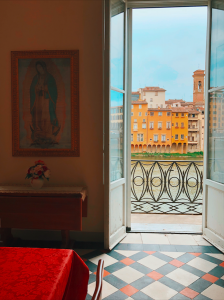 I knew I wanted to take them somewhere with historical significance to Florence, but being that Easter is such a busy holiday here, I hoped to take them somewhere a little smaller and more intimate than some of the huge churches in the city. My trip with my class came to mind and I decided to take them to Santi Apostoli where I had the opportunity to meet the church Friar and later asked him if he had any volunteer opportunities that I could engage in since the church had gained significance to me over my time spent in Florence. 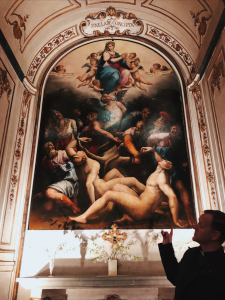 My volunteering at the church was by no means glamorous and consisted of mostly simple tasks such as reorganizing and cleaning rooms that are utilized by the congregation, but it was the opportunity I had to meet and engage with locals of Florence that made the experience special to me. I had the chance to get to know the Friar of the church, Friar Scott, who showed me around and taught me about the history of the building and its art. I also worked alongside a kind woman who regularly volunteers there especially with the children. 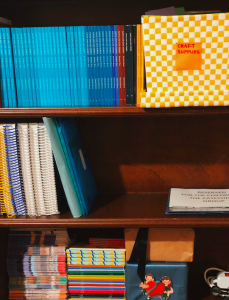 One of my times spent volunteering I reorganized a book shelf where they keep much of the materials used by the children such as books and craft material, a very simple task. Later that night I received a voice message from the Friar explaining how thankful he was for my help and how it makes such a difference to them which made my little time spent helping feel very rewarding! Although I do consider myself religious, I did not grow up in the Catholic church, and with Catholicism being so important to the history of Florence and its people, I was able to learn many interesting things about the religion and how it played a role in shaping the city. Not only was this a chance for me to become more involved and engaged with the Florence community, but it was also an incredible learning experience, and something that I will always think of when I reflect back on my semester spent in Florence. Erin is a SAI Florence spring 2018 student from the College of Charleston.